Entries cover the moral relationship between humans and their natural environment, specifically targeting the contemporary green movement. 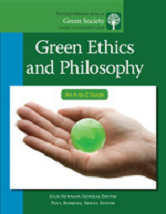 Since the 1960s, green ethics and philosophies have helped give birth to the civil rights, feminist, and gay rights movements, as well as contemporary environmentalism. Includes a chronology, introduction, resource guide, and reader's guide.